Each winter I always have a project to work on... a new bed, a new structure & this year it was revamping the veggie garden. This will actually be the 5th time I've changed it up :) Originally it was just long rows of soil.. the traditional garden plot which just looked like we buried three bodies there. Just an FYI... I'm not very traditional & didn't like looking at bodies. The next was adding wooden boards. B-O-R-I-N-G... 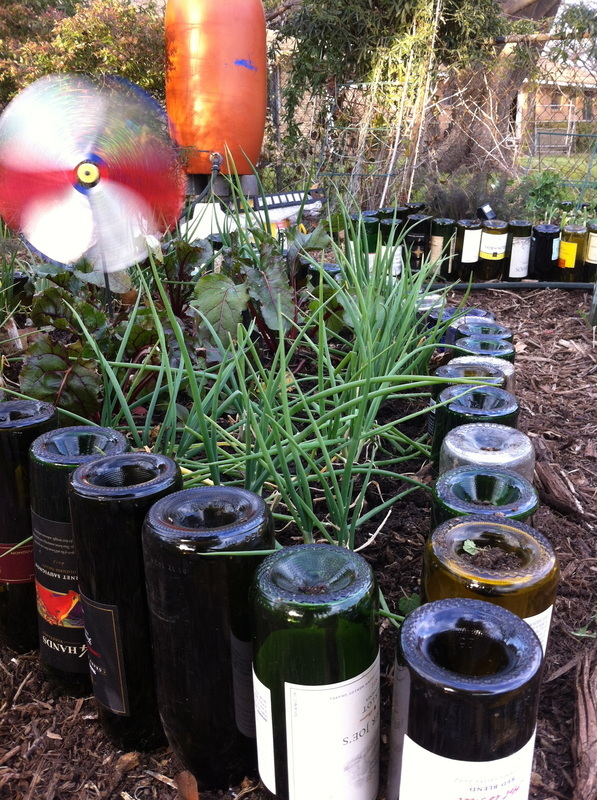 It was very functional as the soil didn't spill out & I could plant all the way to the edges. In the end, this sad plot didn't get much attention as it just wasn't aesthetically pleasing to me. Next, my super awesome husband came up with a fantastic idea of 1/4 on the sun design. I LOVED it!! After using this a season, it became apparent to me that the middle plot: A. looked like a coffin & B. was too wide. FYI.. make your plots no wider than 4 feet unless you have some seriously long arms. So, we (Sean) split that middle plot into a diamond & rectangle like shape. MUCH BETTER!! We used this for a number of seasons & it worked great. The only thing is the spaces in between each bed is just a little too narrow so you need to be careful not to trip. As the years have gone by, the wood has started to rot & boards were falling apart. Which brings me to my winter transition from wood to glass. Thankfully I have wonderful friends who love wine as much as I do. Everyone collected bottles & I was able to finish my project. I am so pleased with the look. 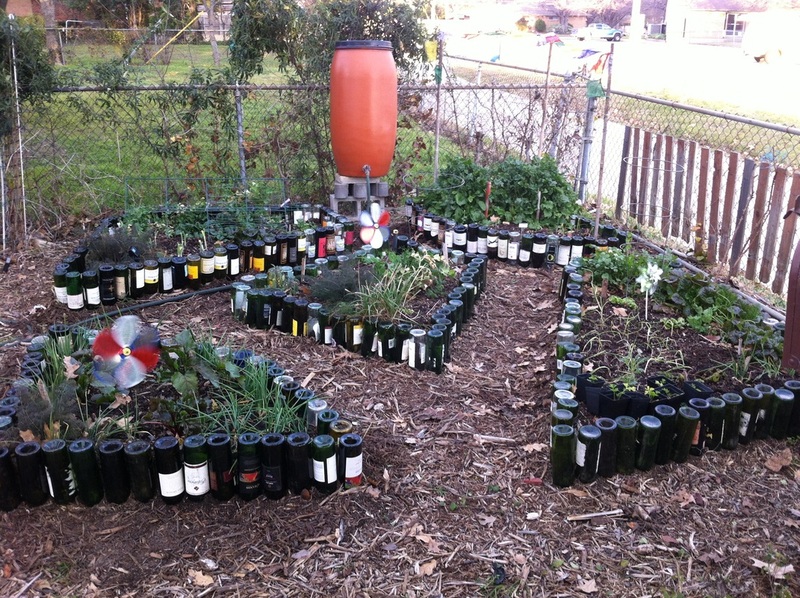 When I sit out there & gaze upon the plot, I think about how each bottle represents a nice time of sharing a glass with friends. Perhaps even a few laughs & wonderful memories made. This past weekend was absolutely gorgeous! You have to love Texas “winters”. Had my tank top, jeans & wellies on & played in the yard for 2 days. The best part of the winter clean up is seeing all the baby sprouts in the yard. Moving from one plant to another, clipping off dead branches, moving brown leaves, exposing the new growth of soon to be large flowering plants. Just puts a smile on my face. When people see my yard, it’s a mix of beds & pathways, they always ask how much time it takes me to tend to it. I tell them much less time than when I had a lawn & had to mow & water weekly. There are definitely times when I devote a lot of energy in the yard. Clipping away dead branches, pulling away the leaves & putting them on the driveway to mow, then putting the crushed leaves back into the beds. That’s the winter clean up & it usually doesn’t take more than a few hours on a Saturday & Sunday. Even though I know we will have another freeze soon, I just wanted to share some thoughts about loving the signs of spring & delighting in a new garden gadget. What a treat to be able to present in my own neighborhood at the new Heights Rec Center! This is a great venue & I promise you will leave excited about all the possibilities you have to transform your property. 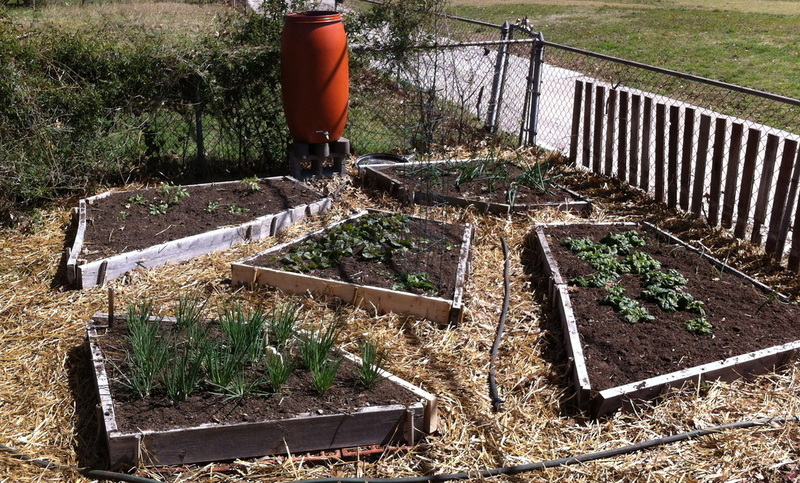 I am super excited to be back at The Mat Yoga Studio to share the steps to set up your spring vegetable garden. The fall workshop was such a fun time & this one will be sure to inspire folks as well. Let the rain come down!!! My favorite type of watering is the kind where I don’t have to do a thing. Just let Mother Nature open the skies. In North Texas, Dallas in particular, we have had a wonderful spring. The rains have been steady & slow which is the way our blackland soil likes it. In order for our soil to take in the water, it has to percolate slowly. When you have mulch & other permeable surfaces in your landscape, that rain will stay on your property & not run off in to the streets where nothing really grows. Another way to keep this water on your property is to store it. 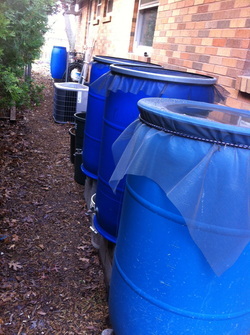 Rain barrels are easy to make & your plants love this water much more than what comes from the tap. Here’s a link to how to make your own rain barrel. On our property, we have eight containers. On the side of my house where no one can really see, I have kept these barrels blue. In the places on view, I have spray painted them so they are more decorative. The plants don’t really care what color they are; they just want what’s inside! The water is mainly used for our vegetable garden & for new plants in the landscape. The rest of the yard relies on Mother Nature for watering. She’s been doing a great job this year! My favorite garden gadget… the trusty moisture meter. I have three… one for the front yard, one for the back yard & one for the veggie garden. There is no automatic sprinkler on my property & water is precious so before I ever reach for my watering can, I check the soil. The good news about our blackland is that it’s predominantly clay & clay soil will hold on to moisture for a long time. Most of us stick our finger in the soil to check for dryness but where are those roots?? Unless you have an eight-inch finger, you are not going to find any moisture! Remember in your landscaped beds, the first three inches should be mulch & the next six inches will be where the roots of your plants are. Roots can go even deeper for a lot of our super smart native plants. For veggie gardens, we usually like to let the first 2 inches dry out before we water those established plants. 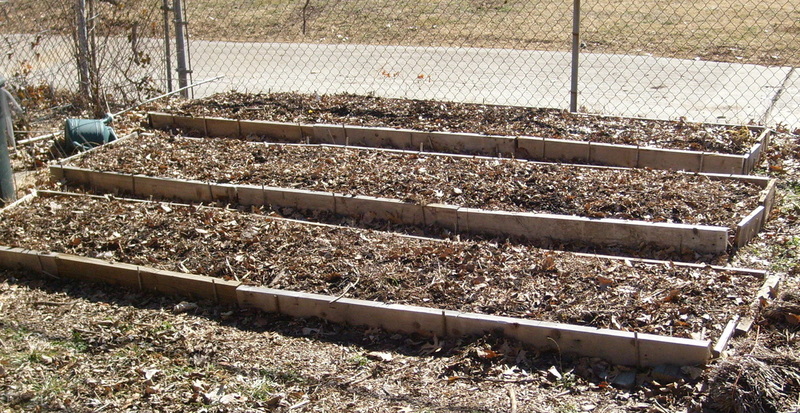 You may also add a little mulch to the top of the soil. You can use straw, crushed leaves & even a little compost. Usually this layer is pretty thin. So your moisture meter will only go down 2-3 inches. 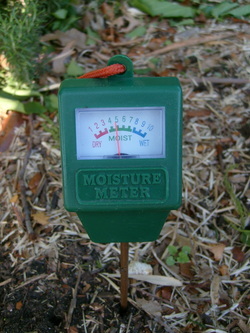 The moisture meter is great for potted plants as well. Sometimes we love too much & often our potted plants may be getting too much water. The moisture meter will amaze you. Also, don’t forget to use a little mulch to top dress those potted plants. Lastly, these meters don’t require batteries. There are no fancy electronics. It works as soon as you place it in the ground. You can find them at nurseries & some of the box stores. Happy gardening! Nothing makes me more happy than filling my red wheelbarrow with lovely native hardwood mulch. Call me crazy but it smells like a hike in the woods & makes the garden complete. This photo is from last year as this year my neighbor had a tree cut down & they offered their ground up tree to me. My favorite - free mulch!! 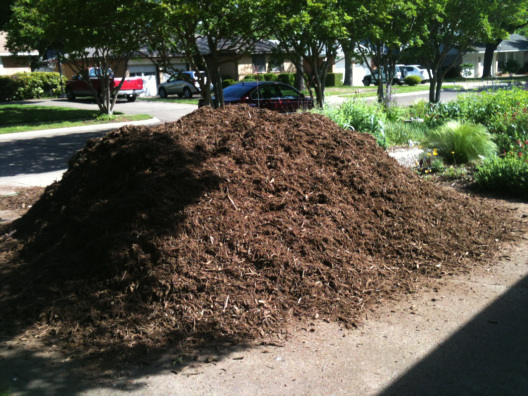 Here's the scoop:The very best way to help save money on replacing plants & reducing water consumption is to mulch. Mulch will help seal in the moisture that is already in your soil & keep your plant's roots cooler in the summer. The rule is to have at least 3" of mulch in your beds. 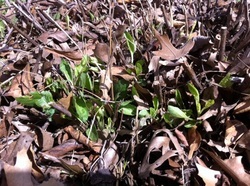 Native hardwood mulch is the best for our beneficial microbes, bacteria, fungi & wiggly worms. As these critters eat the mulch, this not only aerates your soil but also fertilizes the soil. Mulch turns into compost, so as long as you are mulching in the spring & fall, you continuously improve your soil which is the key to a healthy landscape. 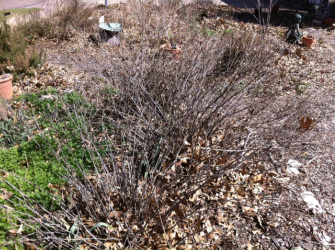 If you are using drought tolerant plants & they are at least one year old, they will need minimal watering this summer. Happy Mulching!